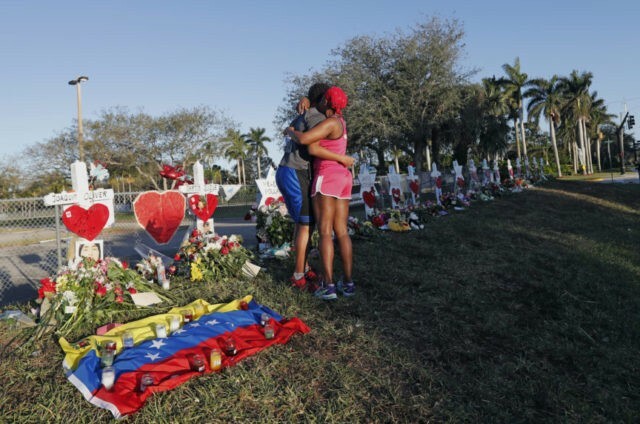 The Broward County Sheriff’s Office on Thursday released 12 minutes of radio transmissions from its deputies and neighboring Coral Springs police, along with recordings of 10 of the 81 calls its 911 center received during the Feb. 14 shooting. The sheriff also released a written timeline laying out how the radio calls correlated with what was seen on unreleased school security video. The 911 calls came from students hiding in the freshman building’s classrooms and parents who were getting calls and text messages from their children. “I’m sorry. I can’t hear you. What’s happening?” the dispatcher responds. But soon a sense of order begins to emerge among the Broward dispatchers and they start giving instructions on keeping the students safe. Just 13 months earlier, the same 911 center had handled a mass shooting at Fort Lauderdale’s airport that left six dead. In a call relayed from nearby Boca Raton, lasting more than 16 minutes, a man reports information from a mother standing beside him. She’s on another line with her daughter who is in a classroom with just one other girl. They have no closet or enclosed desks to hide behind. As the call drags on, the mother can be heard in the background encouraging the girl, who hears noises in the hallway. “I love you, I love you. It’s going to be fine if you hide somewhere. Can you play dead? You need to fake dead,” the mother tells the girl. Seconds later, officers burst into the room and the girls are safe. The mother can be heard telling her daughter, “Tell them to pray, tell them to pray for strength.” The two girls are led out and the call ends. Outside the freshman building, Peterson makes his first radio call almost two minutes after Cruz first fired. “Be advised we have possible, could be firecrackers, I think we have shots fired, possible shots fired,” he tells dispatchers. Investigators say 18 seconds later he took up a position near the building and remained there for several minutes. His subsequent transmissions focus on getting nearby streets and the school shutdown and keeping deputies away from the building. Deputies set up a perimeter. Sheriff Scott Israel has said Peterson should have charged into the building and killed Cruz. Peterson, who has denied wrongdoing, retired rather than accept a suspension and investigation. About this time Cruz discards his jammed gun. His burgundy hoodie from his days as member of the school’s Junior Reserve Officer Training Corps allows him to mix into the fleeing mass and get away.